Blog Are Almonds Safe for Dogs? Are Almonds Safe for Dogs? Could Almond Butter Be My Answer? One of my dogs developed a conditioned emotional response or CER to getting his nails done. He’s completely fine getting on the grooming table or laying down on a bed to have his feet touched. He even takes cookies and lays relaxed while the rotary tool I use to grind them is on. However, when I start to get close to his nails, he jerks back, stops taking treats and is generally not a happy camper to have his nails done. I did a lot of research and we worked up to where he could stay in a happy and relaxed state. I tried traditional clippers but he responded better to the Dremel (a rotary tool with a diamond grinder). You’re wondering how this relates to almonds, keep reading. . . This took lots of positive reinforcement, clicker training, and peanut butter! I used A LOT of peanut butter and I wanted to see if there was another safe option. I wondered what other tasty spreads I could use to keep him happy while I ground his nails to an appropriate length? Are Almonds OK for Dogs? Being pretty natural and holistic, an obvious choice to me seemed like almond butter. My dogs always seemed to beg when I would eat my 100 calorie packs of almonds – but could I give these to my dogs? 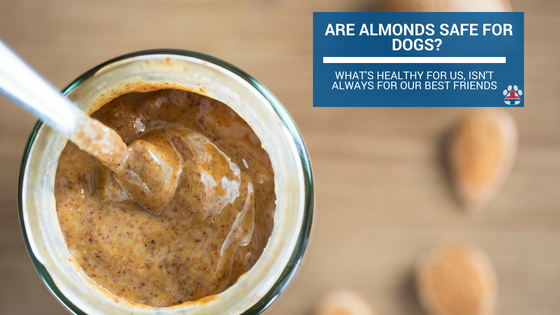 Just because almonds are a healthy “good fat” snack for us to have, doesn’t mean the same for our dogs. In fact, many healthy foods for us could prove the opposite for our pets. Grapes, macadamia nuts, and avocados are just a few examples. Humans have a much longer digestive tract that’s built to burn and churn through the longer digestion needed for nuts like almonds. Dogs are particularly built to use their scissor bites to tear meat and their short, highly acidic GI tract is designed to kill meat pathogens and even handle raw meats. If you drop an almond and Fido is fast to fetch it, don’t worry too much, just watch out for any tummy troubles. If Fido breaks into the pantry and gets an entire bag of salted almonds, you will want to head to the veterinary hospital. Want to learn about more ways you can keep your pets safe, and when an accident does happen, how to best handle it? 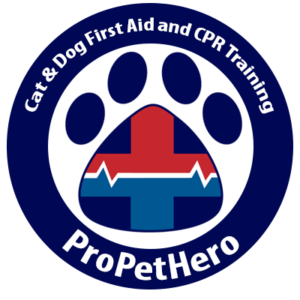 Take our ER veterinary pet first aid & CPR course today. The more you know, the safer they are.